Hoera!! Joseph Puglia - Tuinzaalconcerten Gemeentemuseum is geslaagd! Dankzij 8 donaties die samen € 1.000 opleverden voor Joseph Puglia. Support my concerts inspired by museum exhibitions. Using instruments from the Gemeentemuseum collection, previously in storage for decades. As a violinist wanting to find new ways of connecting with audiences, I started this series in 2015. I wanted to combine innovative programming with an informal setting. The highlight of the series for me has been being able to explore, display, and perform on the museum's world-class instrument collection, which has been in storage since the 1990s. Concerts explore connections between music and the Gemeentemuseum's exhibitions, and we have made them free of charge so that everyone can attend. Your contribution will be used to cover the travel expenses and organizational costs for the fantastic musicians playing with me in the final concert. This season we have six concerts:October 9th, November 13th, and December 11th in 2016, and January15th, February 9th, and March 5th in 2017. All concerts take place on a Sunday at 3pm. Two of the remaining concerts are inspired by the Gemeentemuseum's celebration of 100 years of De Stijl. These explore Dutch contributions and innovations in the music world in the past 100 years, and the program runs from the Baroque era to the modern day. These two concerts are done in collaboration with the Nederlands Muziekinstituut, Asko|Schoenberg ensemble, and the Royal Conservatory in The Hague. The third remaining concert is inspired by the Gemeentemuseum's exhibit on Sol Lewitt. Sol Lewitt often created a concept in his art and left the creation and execution to another person. In this concert we will explore the musical equivalent: the relation between composer and performer. The concert consists of a trio by Bartok which was co-commissioned by jazz clarinetist Benny Goodman, and a violin sonata by Beethoven whose history is a case of truth being stranger than fiction. 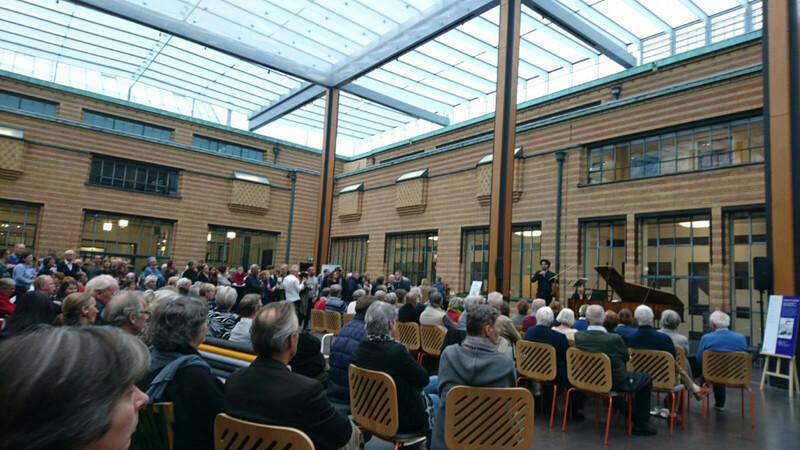 The concerts take place in the Gemeentemuseum's Tuinzaal - the museum cafe, which is a wonderful indoor atrium with a glass roof. My musical collaborators, aside from being good friends and colleagues are also wonderful musicians in their own right. They are all well established in The Netherlands,know the chamber music repertoire like nobody's business and have performed throughout the world to critical acclaim. We have already received generous financial support from the Gemeentemuseum, Fonds21, the MAOC Gravin van Bylandt Stichting, and some private donors. But we are still searching for funds to cover some organizational costs. In order to reach this goal, we need your support! Leuk project. Ik kom in aanraking met muziek die ik zelf nooit zou kiezen en dat blijkt verrassend leuk..
Ik heb op 15 januari in het gemeentemuseum een fantastisch concert beleefd met Joseph en zijn musici, en gun anderen er ook van te genieten. A 40 minute house concert to take place in the summer of 2017, date TBD. For people living within 150km of Den Haag. Plus my signed CD of music by Luciano Berio.